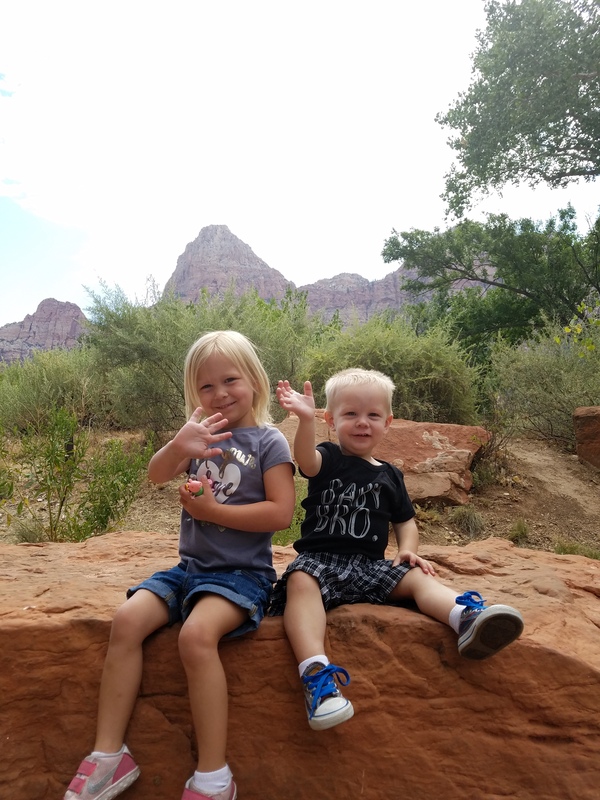 Finley and Pierce are ready to take on Zion! 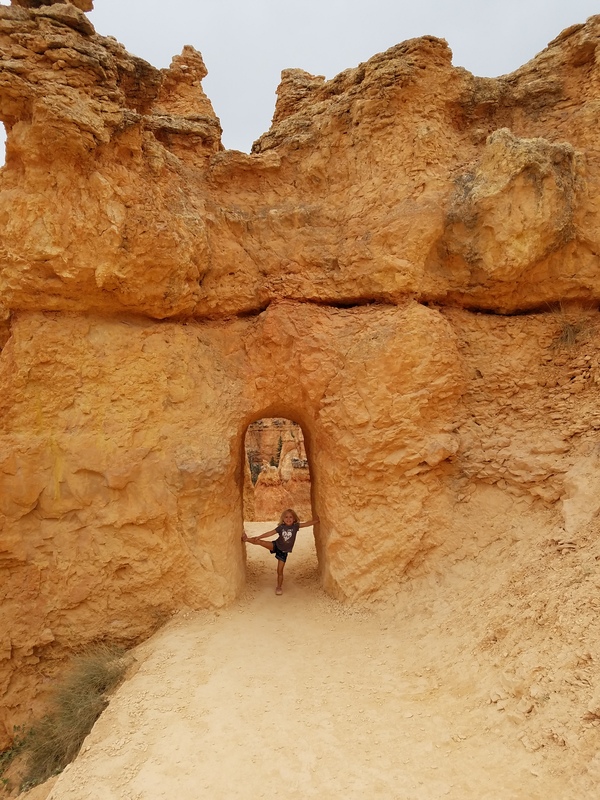 On day 2, we woke up in St. George and fled from our yucky hotel super quick-like! We drove to a nearby Smith’s grocery to pick up things for our picnic lunch and take advantage of the in-store Starbucks. 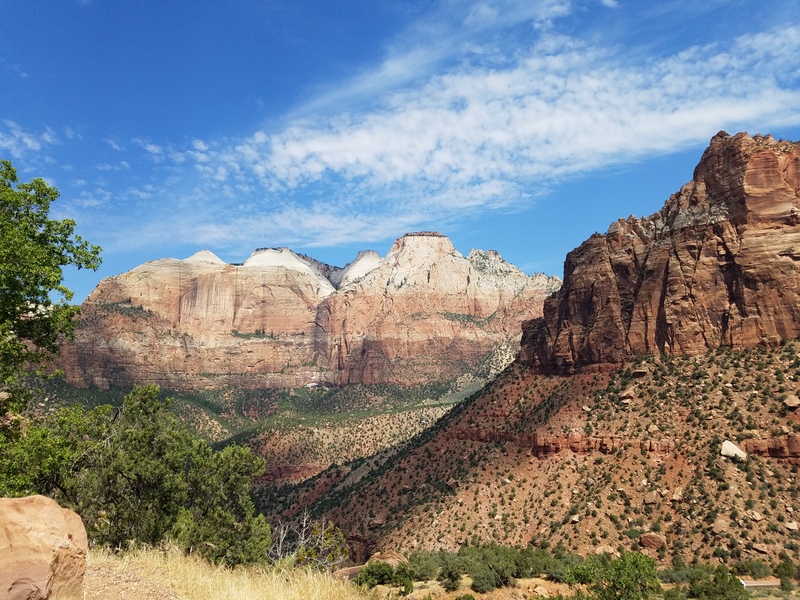 After that, we were ready for the first national park of our epic road trip: ZION. 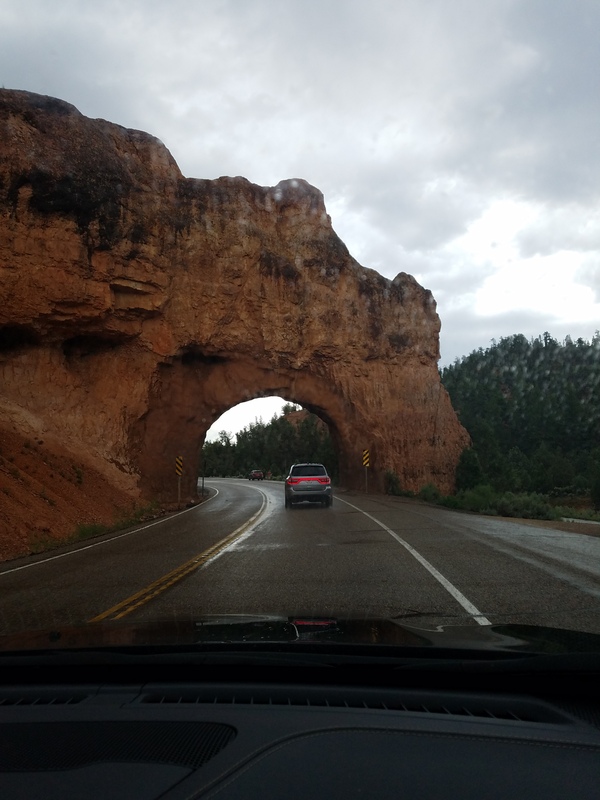 It’s about a 30-40 minute drive from anywhere in St. George, and the drive is really enjoyable and beautiful. 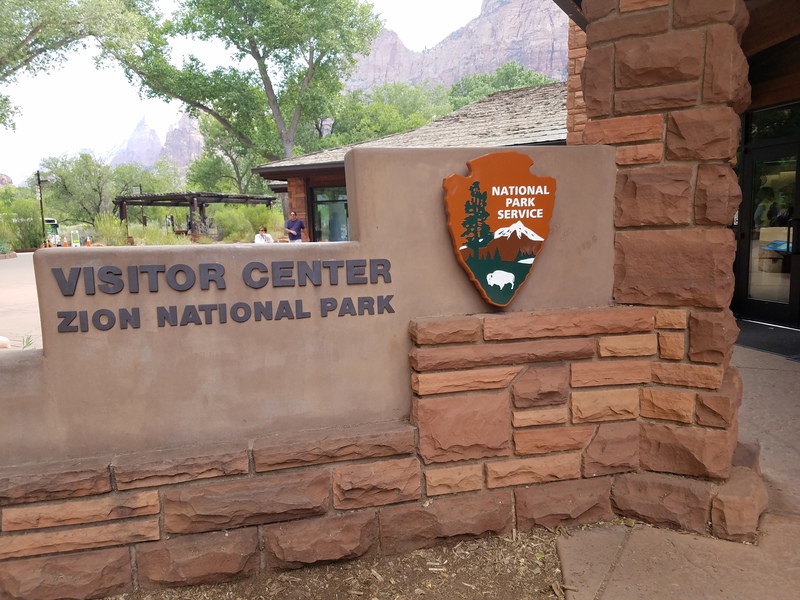 Our first stop was to the Visitor’s Center to purchase our National Parks passport and get our first stamps! 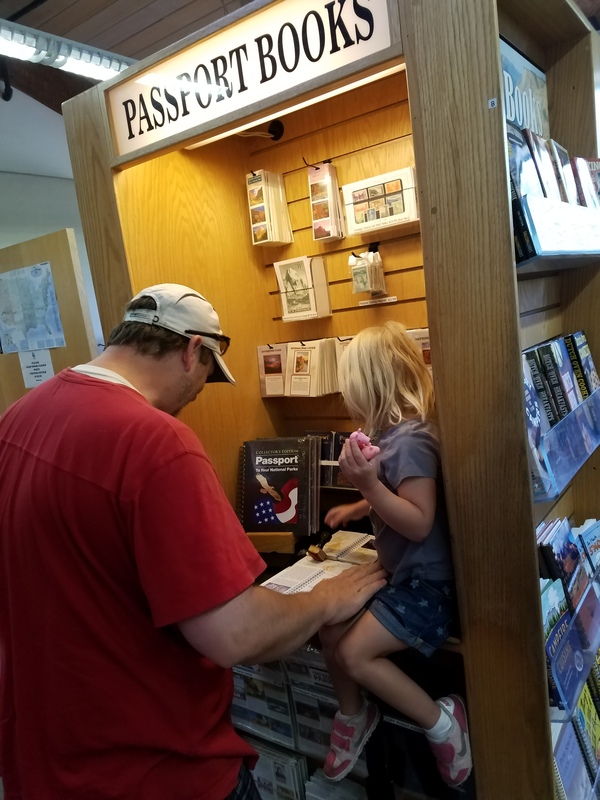 You can learn more and purchase your passport book from multiple places online, or purchase from the visitor center at most National Parks and Monuments. 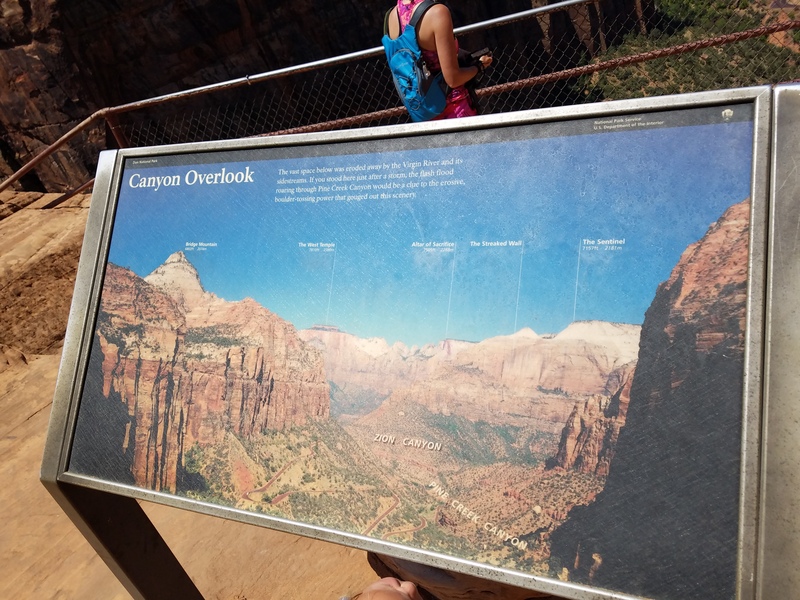 After we had our passport book stamped and in hand, and upon seeing how crowded Zion was on a Saturday in July, we decided to go straight to that day’s hiking adventure: the Canyon Overlook Trail. 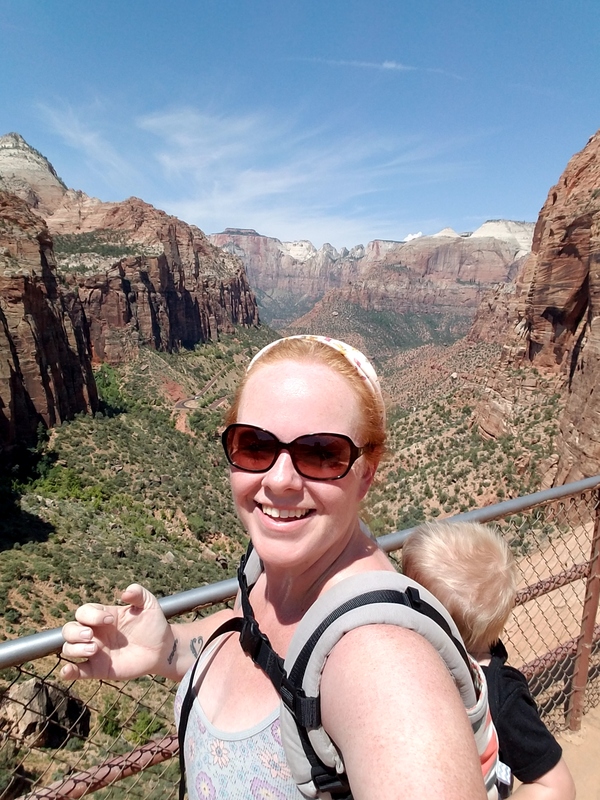 Fortunately this was not our first visit to Zion and we know it won’t be the last, so we were perfectly fine skipping the more popular, crowded sites. 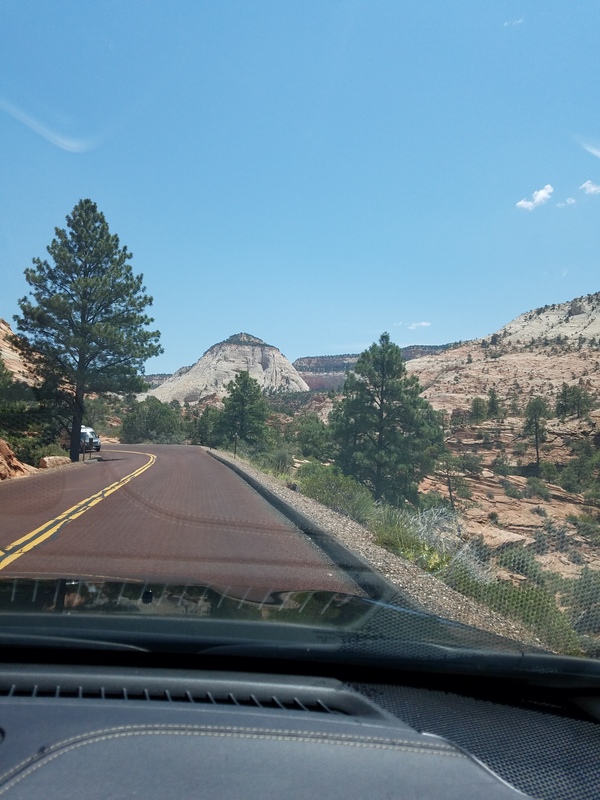 The drive up to the top of Zion brought with it amazing views! 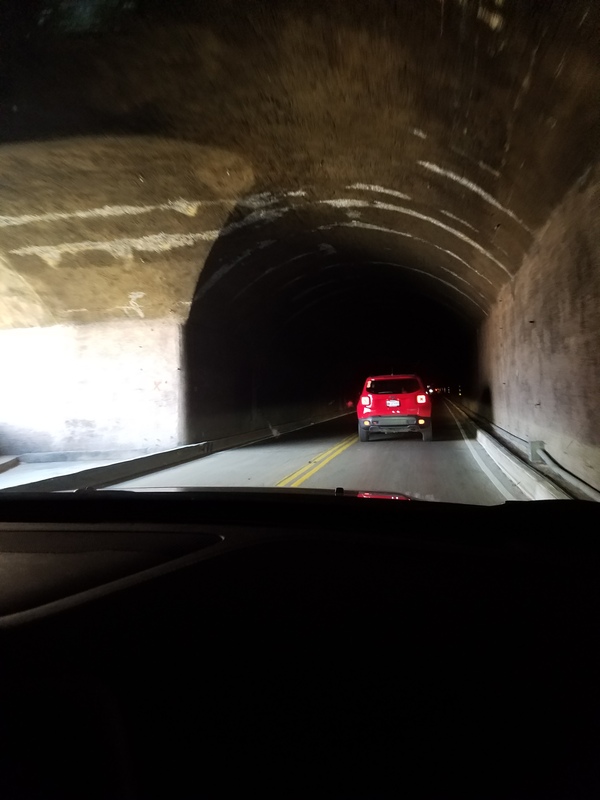 One thing I was super excited about after planning our trip was driving through the Zion-Mount Carmel tunnel. 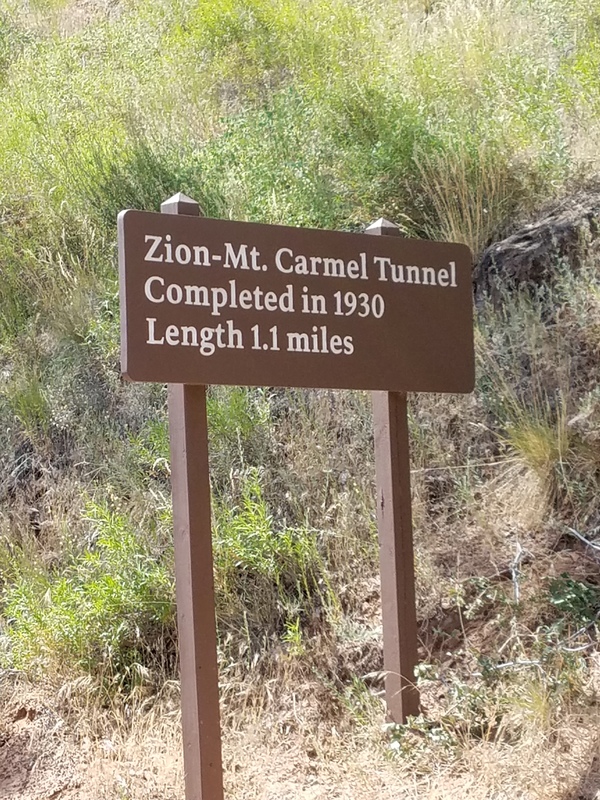 When the tunnel was completed in 1930, it was the longest of its type. 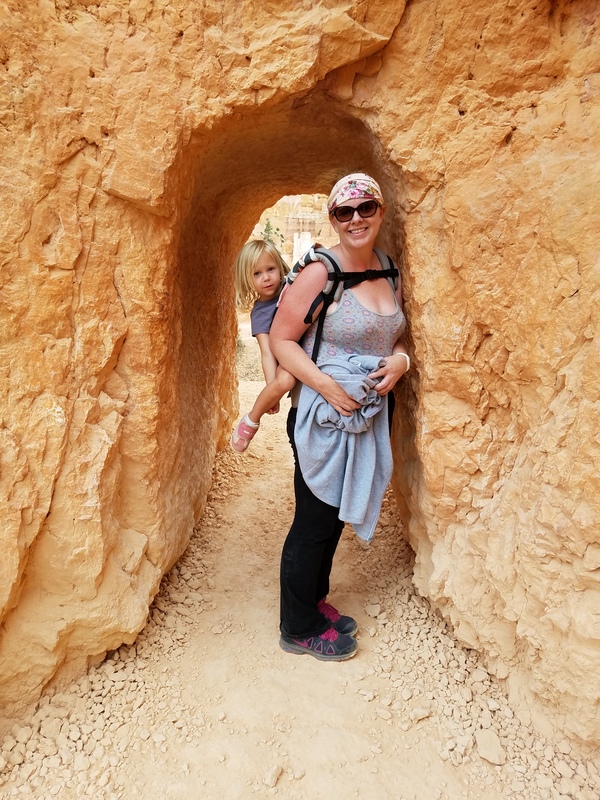 It was created to create access to Bryce and the Grand Canyon from Zion, and accessing Bryce was exactly part of our plan! 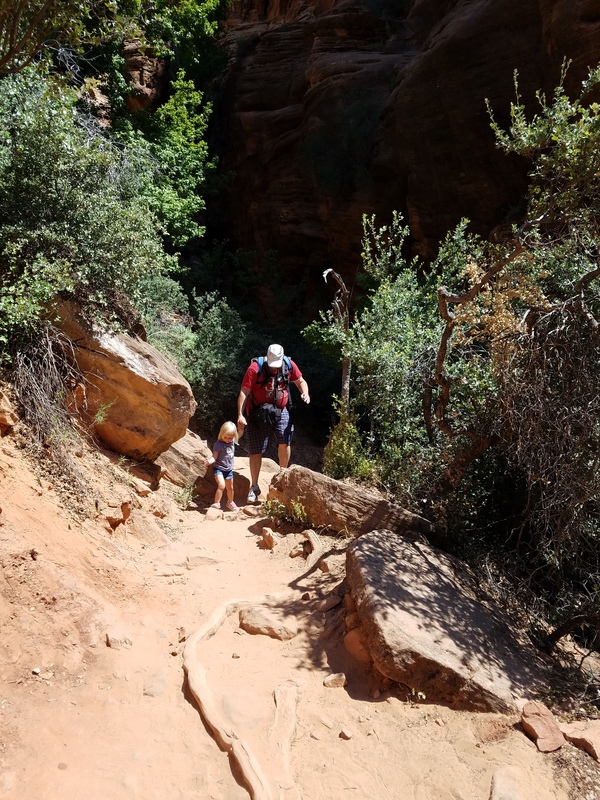 We love hiking, both with and without toddlers, and highly recommend this hike. 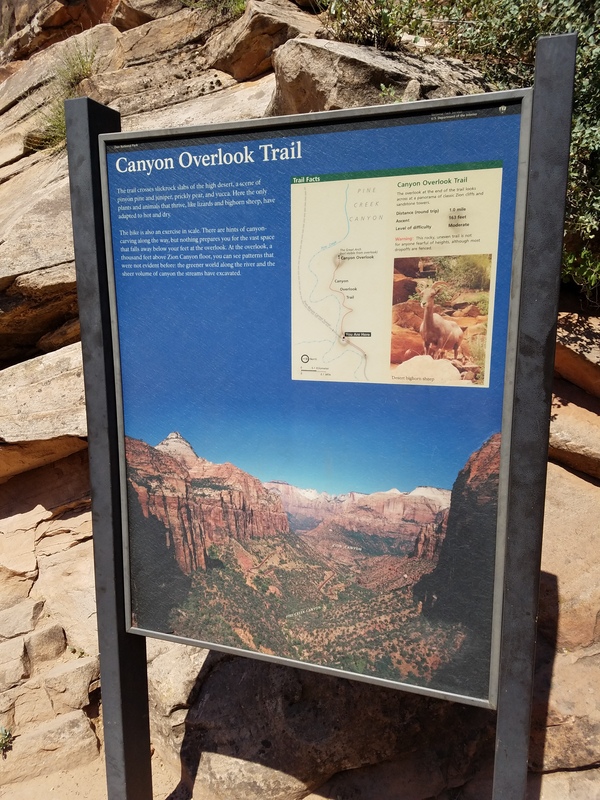 If you are going to try the Canyon Overlook trail, be paying close attention the moment you exit the Zion-Mount Carmel tunnel heading east. 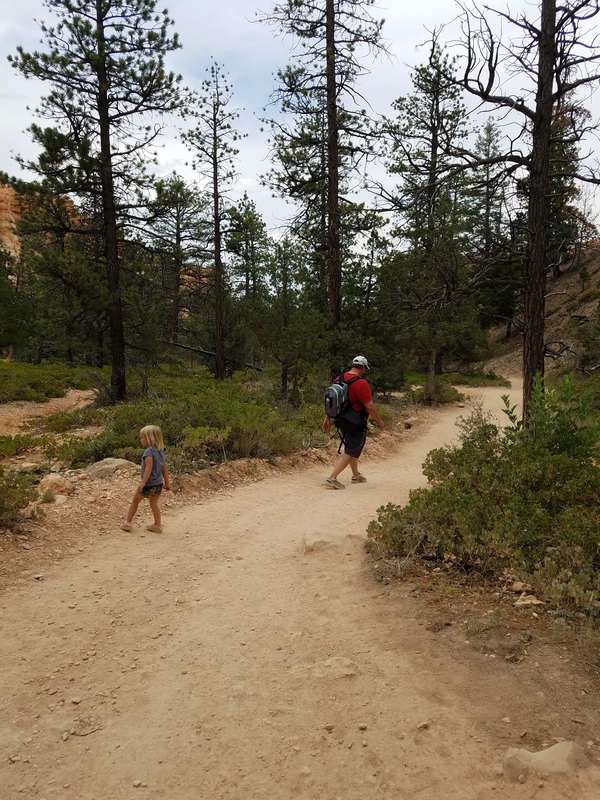 The very small parking area for the trail is immediately on your right upon leaving the tunnel, with a walkway across the road to the trail. 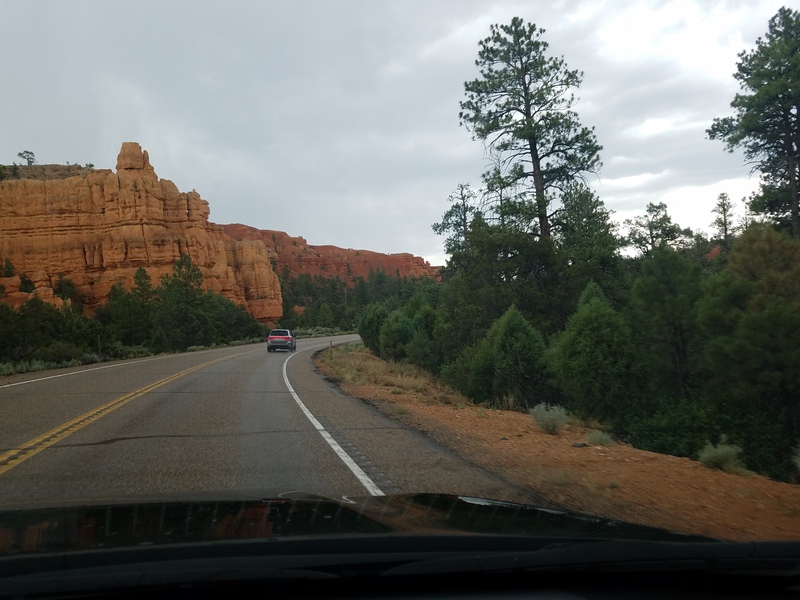 There is also parking a little further down on the left side of the road, and it can be tricky with all the oncoming traffic, but doable, and we were able to find a spot there. This is only a one mile hike. 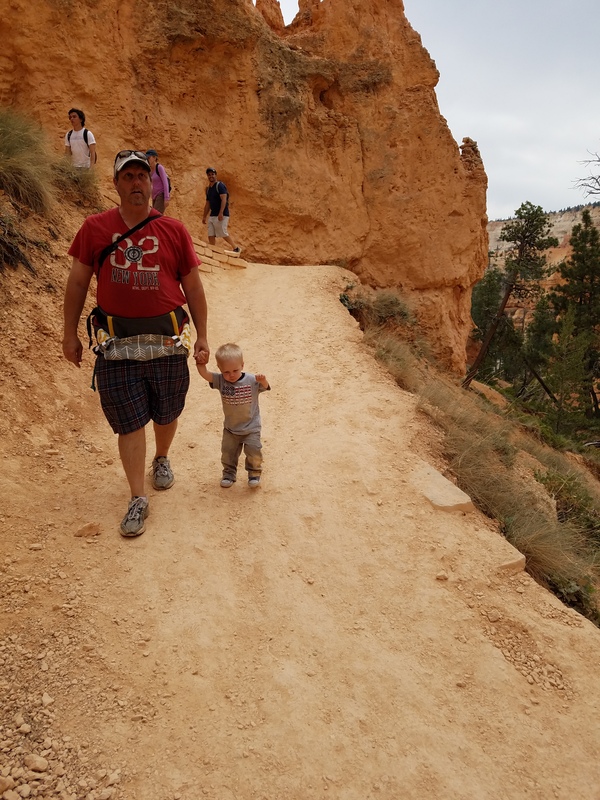 There are places where little ones could take a tumble so hang on tight, or carry them! The views at the top are worth the work. 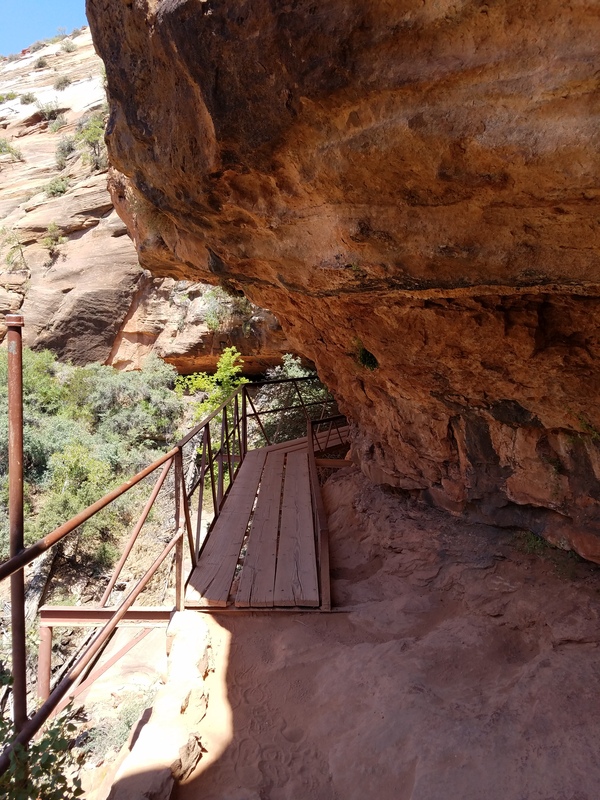 Most of the hike is out in the hot sun, but there was a cool little cave-like overhang where we took a break and had our picnic lunch on the way back down. 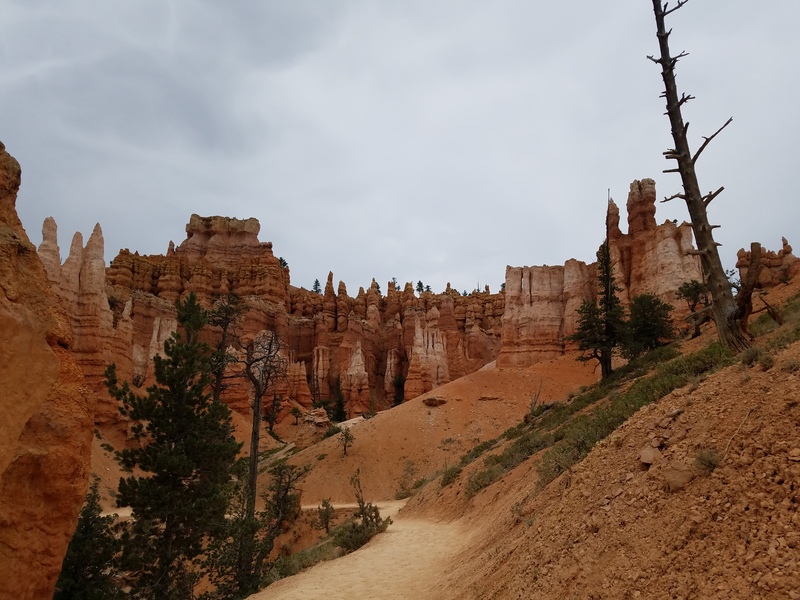 After the Canyon Overlook trail hike, we continued heading east to spend the second half of our day at Bryce Canyon National park. 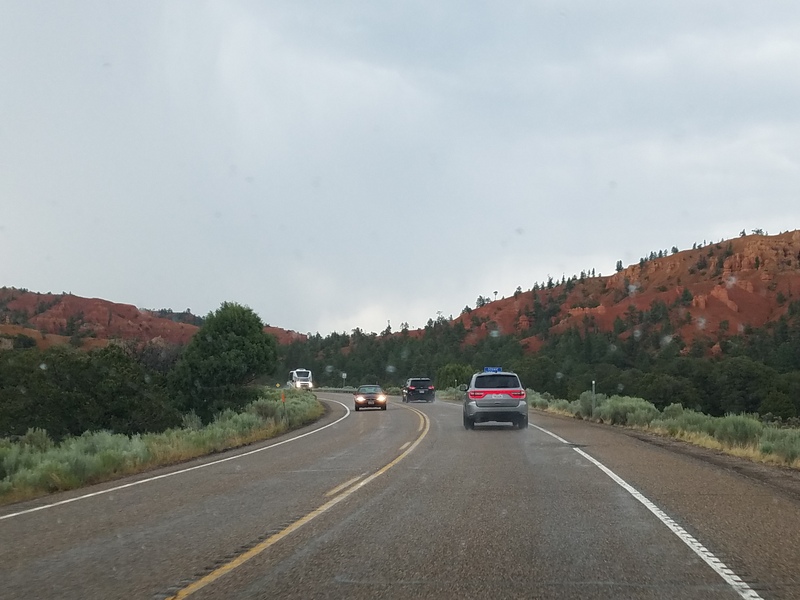 It was a breathtaking 1.5 hour drive, and we got some rain along the way that made things nice and cool. It also worked perfectly with naptime! 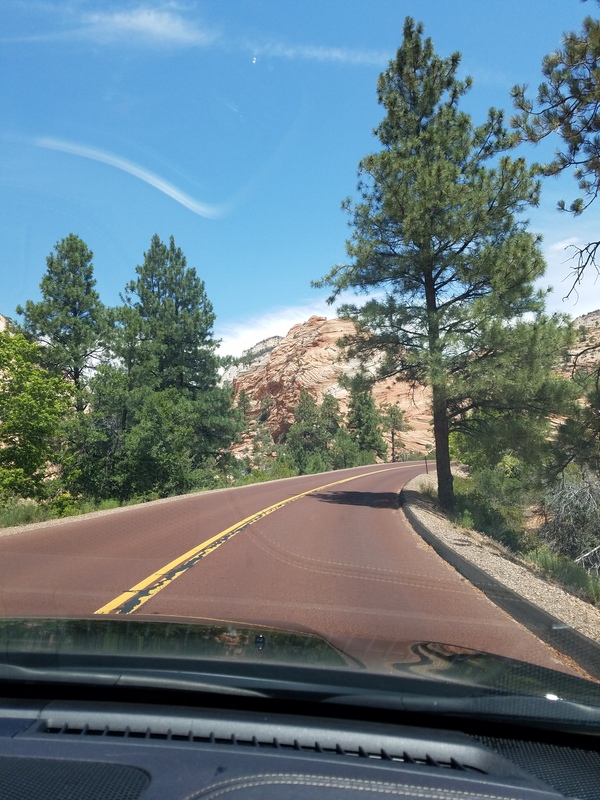 Exiting Zion National Park on the eastern side. 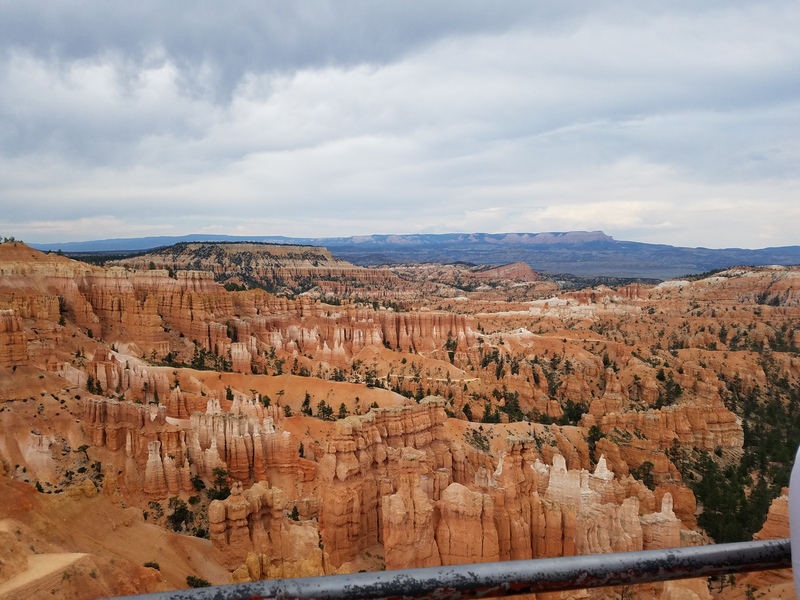 Between Zion and Bryce is Red Canyon. We had no idea what a treat we were in for, but driving through was amazing. 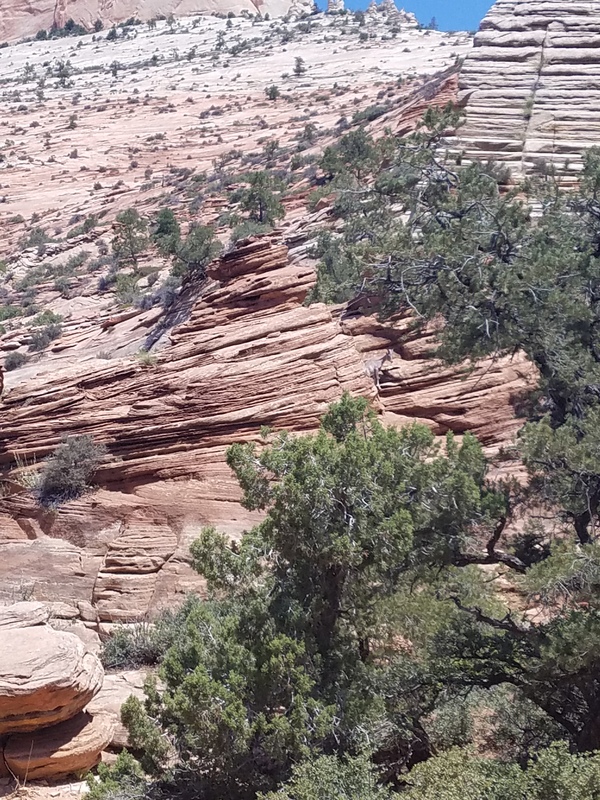 Pictures don’t even begin to capture how truly RED these rocks were. We look forward to including this as a big stop next time we do Zion and Bryce! 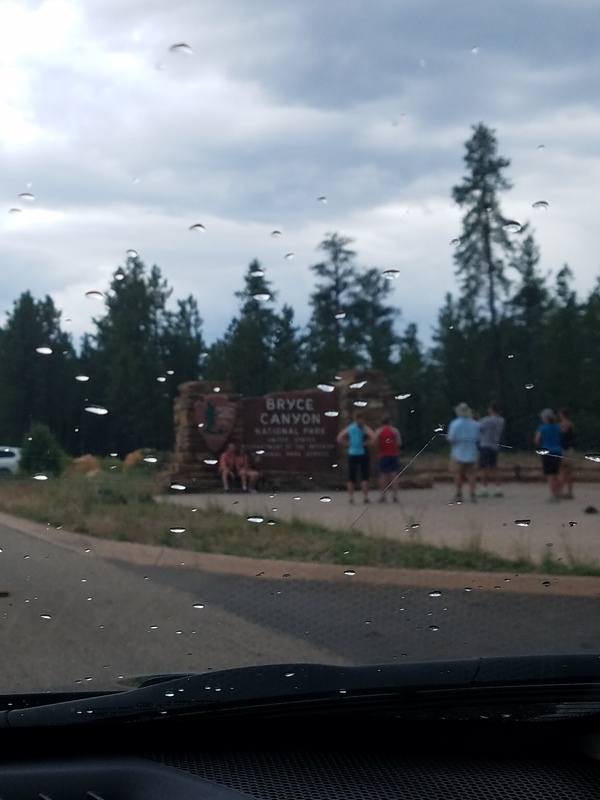 We made it to Bryce Canyon mid-afternoon and mid-rainstorm. But the temps were great and the crowds were small, so we were happy. 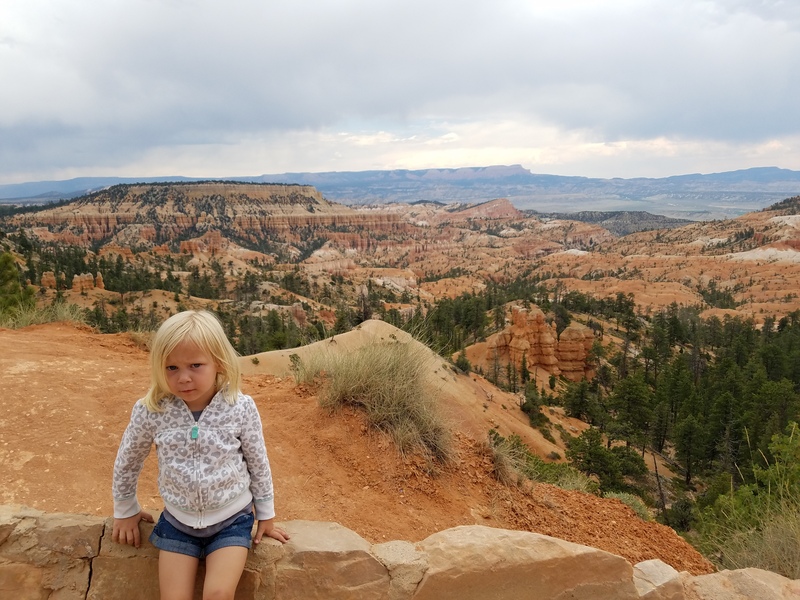 For Bryce, we parked our car at the visitor center and took the shuttle bus to give the kids a break from the car. But not before stopping in for a stamp in our passport book! 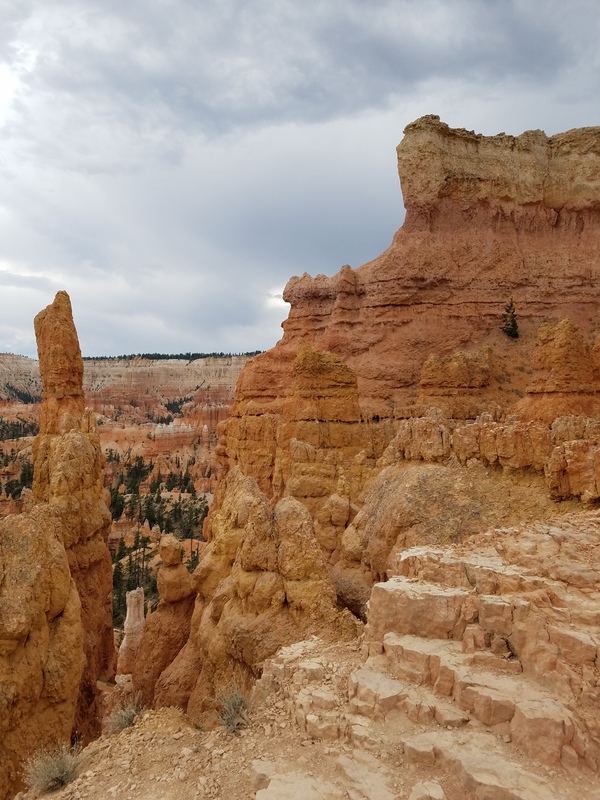 In Bryce Canyon, two of the most popular hikes are the Queens Garden trail and the Navajo Loop. You can also do both, and we decided to be wild and crazy and go for it. 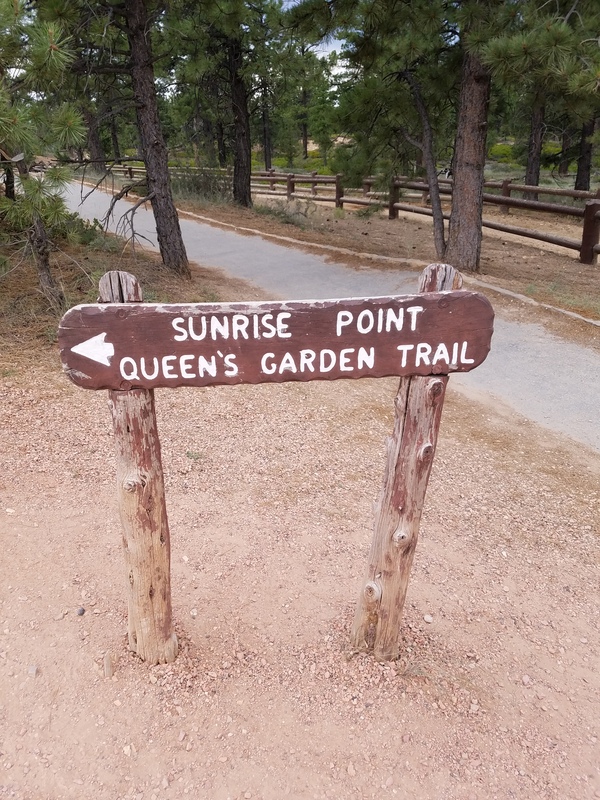 You can start at Sunrise Point with the Queens Garden trail, get onto the Navajo loop down at the bottom, and come up at the Sunset Point. Or you can do it the other way around. At the top, Sunrise and Sunset points are connected by a nice flat path with gorgeous views. You can walk that path only for something less strenuous or if you have parked your car at one end or the other. 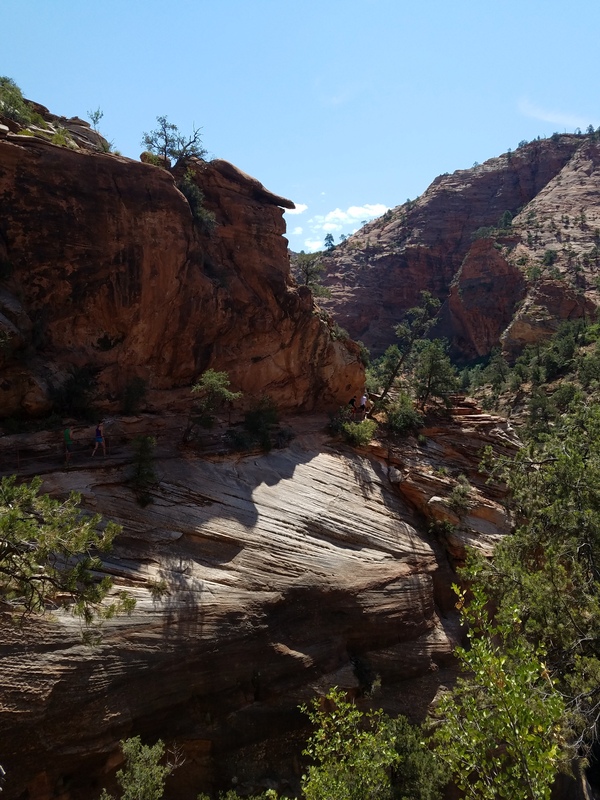 Not gonna lie…this hike was a challenge for us. Going down before coming up is always a little less fun. The views all the way down and back up again were AMAZING! 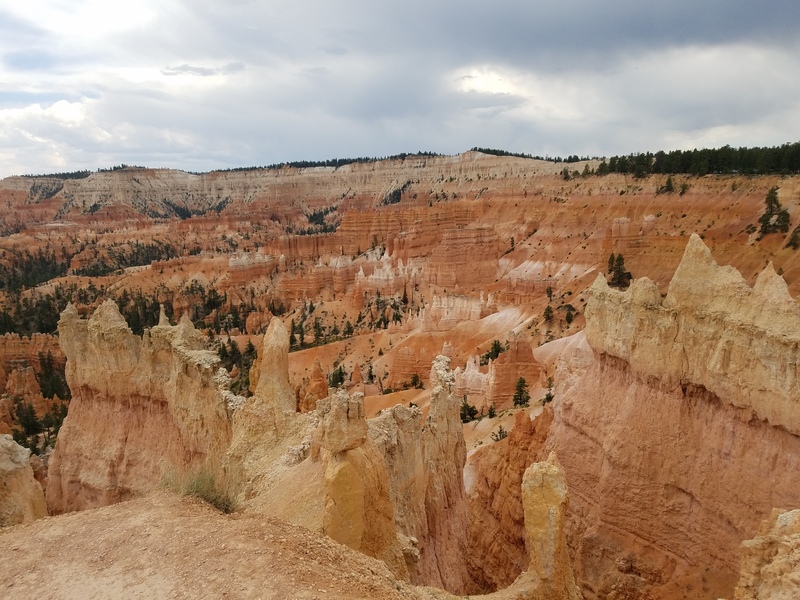 All of the hoodoos on the way down were almost unbelievable! That night, we stayed in Tropic Utah. Tropic is teeny-tiny, but really clean and has what you need for the night. We stayed at the Americas Best Value Inn. It was not fancy, but it was spotless and the free breakfast was great. After arriving at our hotel we took some much needed showers. For dinner, we walked to the pizza place (its literally called Pizza Place) in town and walked back to our hotel. 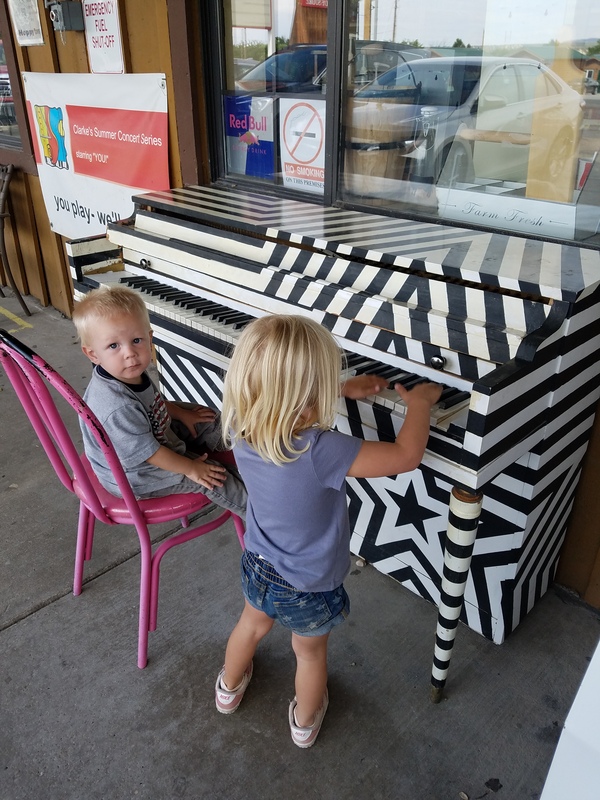 There’s also a little grocery store and restaurant with a cool piano on the porch! And Bryce Canyon Coffee Co. did NOT disappoint the next morning! Day 2 was complete, and we loved every minute!